Lumbar spinal degeneration describes the usual age and activity-related changes that occur in the lower back, as well as atypical alterations due to injury or structural abnormality. Tissue degeneration is a normal part of getting older and the spinal column certainly suffers its fair share. In fact, of all the spinal regions, the lower back deteriorates the earliest, the fastest and the most significantly in virtually all human adults. 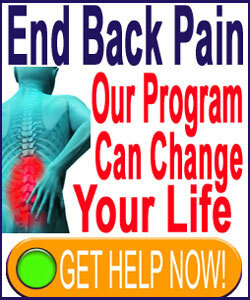 Degeneration is a word that frightens patients, as it is often used to explain lower back pain. However, we must be clear that the degenerative processes are not inherently painful and they do not necessarily create any problems in backbone form or function. Patients might experience pain from some types of degeneration, but severe and chronic pain rarely results from any normal spinal aging concerns. This educational essay helps patients to objectively view spinal deterioration and understand what the degenerative processes really mean to them. We will provide details of how the spine ages, as well as examine the factors that can accelerate and exacerbate structural degeneration. The spine begins to age early in adulthood. Most people begin to demonstrate distinctive signs of age-related changes in their late 20s. Some people demonstrate these changes slightly later, while many others display spinal aging much earlier. For example, I was diagnosed with moderate degenerative disc disease at the age of 16, which is not nearly as atypical as it might seem. The spinal aging processes usually begin in the lumbar spine and do not require injury or special circumstances to commence. The lumbar spine must work continuously to support our bodies and provide a vast array of possible movements, all under considerable duress. This accumulated spinal stress wears on the tissues rather quickly and the first structures to demonstrate the effects are the lumbar spinal discs, most notably L4/L5 and L5/ S1. These discs will shrink in mass by the process of desiccation, which basically means that they dry out. This loss of disc space height brings the vertebral bones closer enough to interact more frequently and more substantially with one another. Degeneration of the spinal discs also helps facilitate lumbar intervertebral herniation. The interactions between spinal bones will degenerate the vertebral bodies, causing the growth of osteophytes on the bony surfaces. It will also wear on the spinal joints, causing facet joint spurring and the deterioration of the protective cartilage and synovial fluid in these capsule joints. 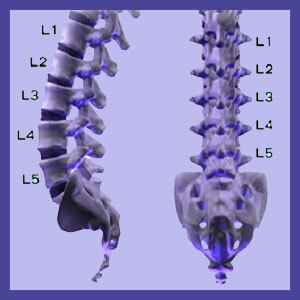 As the structure of the spine changes with age and activity, it is also common for the spinal curves to change, as well. Some patients develop of lumbar hypolordosis, wherein the patient loses some of the typical curvature in the lower back. Hyperlordosis is also possible, but is not usual, given normal spinal degeneration. Spondylolisthesis can occur when the pars interarticularis fractures and allows the vertebra to migrate forwards or rearwards, out of alignment with the remainder of the spine. Degenerative spondylolisthesis is one of the most common varieties of vertebral slippage condition in the lumbar spine. Lumbar adult scoliosis might develop due to degenerative changes to the spinal anatomy. Ligamentous ossification usually affects the longitudinal ligament, but can also affect the ligamentum flavum in rare cases. In contrast, ligamentous hypertrophy usually affects the ligamentum flavum, but might also affect the longitudinal ligaments of the spinal column. While facet joint degeneration is universal, the development of facet syndrome is not commonly seen. Facet joint syndrome describes age and activity-related pathology of the spinal zygapophyseal joints. Injury can escalate already present degenerative processes, as well as inciting new degeneration of traumatized tissues. This is why it is so common to see symptomatic forms of degeneration following massive traumas, even years after their initial occurrence. Car accidents, falls and sporting injuries are all usual sources of heightened degeneration in the spinal anatomy. Lumbar spinal surgery is one of the lesser known causes of spinal deterioration. Virtually all of the modern surgical techniques will create the ideal circumstances for degeneration to affect the operated tissues earlier and more severely than if surgery was never performed. Most procedures will also impart similar degenerative predisposition to many of the neighboring spinal tissues near the operated site. Spondylodesis, more common called spinal fusion, is known to dramatically increase the rate of spinal degeneration. Fusion changes the natural engineering of the backbone and makes neighboring levels highly susceptible to stress, being that there are no intervertebral spacers present to protect the tissues from shock, impact or tension. Similarly, many spinal implants can also escalate the spinal deterioration processes, since these place inordinate stress on particular areas of the spinal anatomy.